KIEV, Ukraine -- Ukraine's new government will give "broad cultural autonomy" to the country's regions, including to choose the main language used in local government and schools, the president's deputy chief of staff said. Anna Herman said in an article published on Saturday in the weekly newspaper Zerkalo Nedeli that Ukraine must be tolerant of the fact that different parts of the country have different values, which should not be promoted across the whole country. "This must be the new ideology of the Ukrainian state, based on principles of wide cultural autonomy for the regions, with the right to choose a language of communication that meets the needs of the majority of inhabitants, to erect memorials to the heroes whose memory lives in their hearts," she said, balancing the language issue with the desire of some in western Ukraine to honor nationalists who fought against the Soviets, particularly during World War II. "Delegating the right to define cultural policies to local governments will remove the existing tension in this area," Herman said. Ukraine's president, Viktor Yanukovych, was elected in February on the back of strong support in the largely Russian-speaking south and east of the country, but was less popular in the more nationalist west. He has said that he would like to make Russian a second state language, but the balance of power in the country makes it unlikely that any political force could secure the votes in parliament necessary to change the constitution. 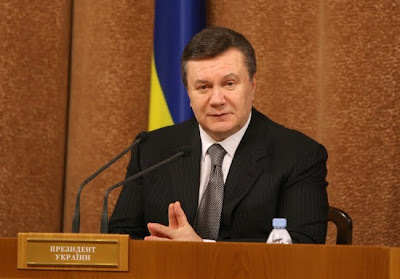 The governing coalition, led by Yanukovych's Party of Regions, is therefore likely to incorporate the European Charter for Regional or Minority Languages into Ukrainian law, which would allow individual regions to use Russian - or other widely spoken languages - for official communication and schooling. Yanukovych's election sparked fears that he would seek to align Ukraine too closely with Russia, but he has been careful to court the European Union as well, and the language policies are being promoted as part of a wider platform of tolerance. A deputy prime minister said on Wednesday that as part of efforts to create an atmosphere of tolerance the authorities would not block any marches held on Victory Day by veterans of the Ukrainian Insurgent Army (UPA), which fought on the side of the Nazis in World War II. "I think such parades will take place in western regions. We will not ban anything," Volodymyr Seminozhenko said, adding that the government would not let things get out of hand. The UPA is at the center of another thorny issue for the new president. After losing in the first round of this year's presidential elections, then-President Viktor Yushchenko awarded the Hero of Ukraine honor to Stepan Bandera, a UPA leader who called on Ukrainians "to help the German army in the fight against Moscow and Bolshevism." The Soviet authorities accused Bandera, who fought both the Nazis and the Soviets in his quest for an independent Ukraine, of numerous acts of murder and terrorism. He was assassinated by the KGB in Munich, Germany, on October 15, 1959. The award was strongly protested in the Russian-leaning east of the country, and on Friday a court in Donetsk ruled that the award was illegal. Yanukovych has said the issue will be settled before the country celebrates Victory Day on May 9, and following the court decision calls for him to withdraw the award intensified.